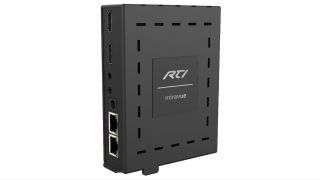 The What: After the acquisition of the Miravue VIP-1 earlier this year from the company of the same name, RTI is now shipping the video-over-IP system. The What Else: For increased flexibility, the VIP-1 acts as a transmitter and a receiver, lowering AV distribution costs by reducing components, cabling, and installation time. The unit encodes H.264 video up to its highest supported resolution (1080p) along with Dolby 5.1 audio with ultra-low latency. The result is a high-quality video output signal with low network bandwidth requirements. The VIP-1's built-in scaler matches the displays' maximum resolution, while automatically providing stereo downmixing and lip-sync adjustment. Network video streams from IP security cameras may be viewed without the need for additional equipment. "For our dealers, the incredible flexibility of the VIP-1 helps lower the costs of AV distribution in commercial and residential projects," said Mike Everett, vice president of global sales, RTI. "The unit is an exciting addition to our expanding line of AV distribution products and the RTI ecosystem as a whole." The Bottom Line: Well suited for new and retrofit installations, the VIP-1 delivers high-quality HD video over wired and wireless Ethernet networks. Due to its low bandwidth usage, the transceiver is compatible with virtually any networking gear, from an unmanaged switch for smaller applications up to high-end gigabit Ethernet switches for larger installations. When combined with an XP processor, the video-over-IP system also acts as an extension of the RTI control ecosystem, delivering IR and RS-232 control to external devices.